A Proton-M being readied for launch (Credits: RIA Novosti). On September 11, the Failure Review Oversight Board completed its investigation of the August 6 failure of a Proton-M Breeze-M upper stage. The board confirmed the root cause of the accident as a manufacturing defect and approved manufacturer Khrunichev’s corrective action plan. “This is an opportunity to learn, enhance and improve the overall reliability and processes of our systems,” said acting ILS Vice President and Chief Technical Officer John Palme. The August 6 failure occurred when a pressurization failure in the Breeze-M fuel line caused its third stage burn to operate seven seconds instead of the intended 18 minutes and five seconds. No action has been taken with respect to the Telkom and Ekpress-MD2 satellites that were stranded as a result. On August 7, the investigation board was convened headed by research center TsNIIMash first deputy director O.P. Skorobogatov, scheduled to conclude its work by August 16. 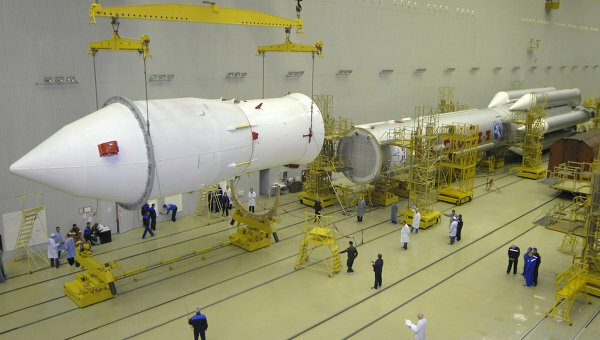 As that date came and passed, conflicting political voices alternately threatened mass punishment for the industry’s slackness and denied any sort of systemic problem in Russia’s space industry. The failure came almost exactly one year after another Breeze-M failure that resulted in the Ekspress-AM4 satellite being placed in a useless orbit. The batch of Breeze-Ms manufactured with the failed unit have already been recalled and are slated to be reworked and inspected. The review board approved that approach and called for an enhanced quality management system to be applied across all Khrunichev facilities. These actions must be completed prior to Proton’s return to flight. The next launch of the vehicle is currently scheduled for mid-October, when it is due to carry an Intelsat satellite into orbit. A reorganization of the industry is in the works that is expected to take place over the next three years. A $21 billion funding allocation was announced by Prime Minister Dmitry Medvedev on September 10 help get the Russian agency back on its feet. Over the course of recent Russian space failures, the consistent attributions that arise are a critical funding shortage and a more critical workforce shortage. Roscosmos’s 200 employees have an average age of 50, an age which continues to rise as younger professionals have not been hired in sufficient numbers or trained to take their places.